This week, more rumors and confusion surfaced about gold ownership, despite gold’s strong technical performance as it rebounded from a low of $1,395.50 on April 12 to $1,467.50 on April 29. Much of the confusion stems from a misunderstanding of the terms ‘allocatedstorage’ and ‘unallocated storage.’ Because Bullion Management Group Inc. (“BMG”) specializes in uncompromised bullion held in secure allocated storage, this is an issue we find ourselves constantly addressing with clients. It’s a black or white area: Either you ownuncompromised bullion bars for which you have title documentation that are stored in secureallocated storage, or you have an unallocated account that can be settled in cash at the issuer’s discretion. There is nothing illegal or conspiratorial about this. The fine print on your precious metals account or bank certificate should make it clear. Yet many investors with unallocated accounts are shocked when they attempt to take delivery of the gold. Many of the myths about allocated and unallocated gold storage are based on partial truth and anecdotal evidence. These embers, fanned by fear and ignorance, lead to irrational investment decisions. Experienced investors know that facts, not emotion, lead to wise long-term decisions. The discovery of facts, often hidden in the fine print, requires an intense intellectual effort. 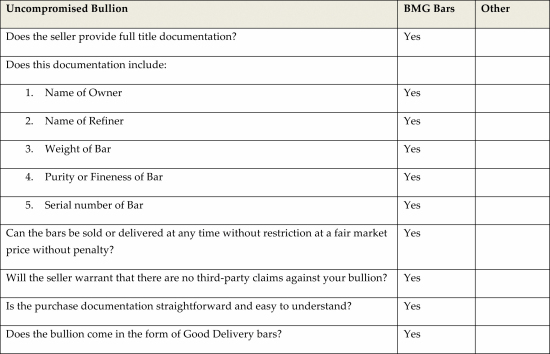 When we first started the BMG BullionBars program in 2008 we, along with several investors, discovered that many bullion sellers and storage facilities were not being entirely honest with their customers. One longtime customer initially balked at our storage fee. He told us he purchased gold at the spot price without any premium, and that it was held in allocatedstorage in Switzerland at a fraction of one percent – much less than typical allocated storagecosts. Having spent a great deal of time and money finding the most cost-effective way to buy and store precious metals bullion on a large scale, I knew something was wrong. I asked him what kind of documentation he was given, and was told he received an account statement showing the number of ounces he held. I then suggested that he ask his dealer to provide him with the refiner and the serial numbers of the bars he owned. He called a few days later to report that the company would not provide this information. I then asked him if the company would provide the total number of bars being held on behalf of clients. Again, the answer was no. The reality was that he didn’t own any bullion at all, and it could not therefore be held inallocated storage for him. He simply had a bullion account that, just like a cash account, was an unsecured, uninsured liability of the dealer. Once he understood that he didn’t really own any bullion, he liquidated the account, purchased bullion from BMG, and put it into trueallocated storage. He received a Bullion Deed for each bar, together with a confirmation of trade detailing the refiner, serial number, exact weight and purity of each bar he purchased. He then entered into a custodial agreement for allocated storage. During a recent visit to Geneva, Switzerland, BMG’s Executive Vice-President, Paul de Sousa, decided to check on these cheap “allocated” storage services offered by Swiss banks. Manyinvestors associate Switzerland with secure wealth preservation and assume that because the account is Swiss, it is allocated. This turned out to be far from the truth. None of the banks questioned offered true allocated storage. In fact, they strongly resisted the “allocated” program, saying it wasn’t worth the extra cost; they did not produce nearly enough documentation to give the investor any form of comfort that he or she actually owned any gold. We have heard several similar reports over the years of investors being lulled into believing that the bullion they thought they held in their precious metals accounts, or even through bank certificates, was the same as bullion in allocated storage to which they had a direct claim. Much of this confusion can be placed squarely on the shoulders of the salespeople who themselves may not have fully grasped the difference. However, most of the responsibility lies with the investor who didn’t read the fine print, and was attracted by artificially low costs. When you store hundreds of thousands or millions of dollars’ worth of precious metals, low-cost storage should not be your major criterion. Direct ownership of the bullion should be your first concern; no one else should be able to deal with it in any way without your permission. 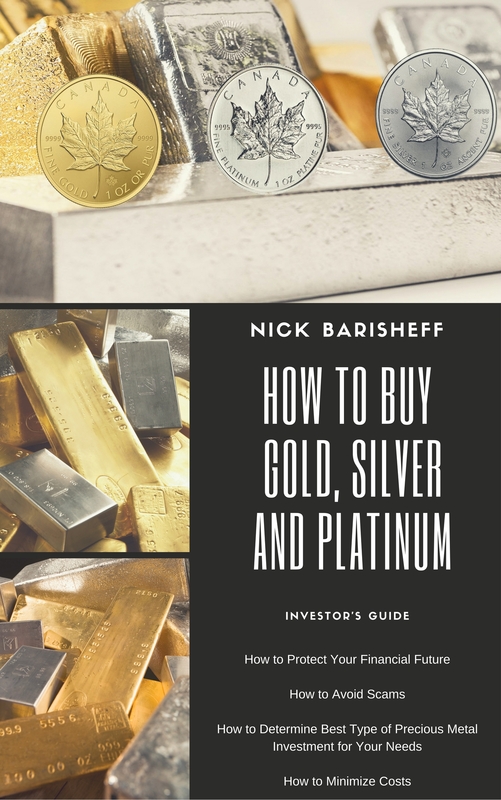 The first step in the two-step process is purchasing the bullion and having documentation that legally transfers title to specific bars to you. From a legal perspective, this is fundamentally the same as purchasing any other tangible asset such as a house, a car or a boat. The asset needs to be described in detail, and appropriate representations made by the seller. The same applies for gold. Once payment is made, documentation transferring ownership to the purchaser mustinclude the name of the refiner, the serial number, the weight and purity to three decimal places. While client identification for money laundering and anti-terrorism compliance must be kept by the seller, the seller should provide a written confidentiality agreement to maintain the privacy of the client. The second step – finding and maintaining secure allocated storage – is just as important as the first step. To insure instant liquidity, the vault must be a London Bullion Market Association (LBMA) member vault. The LBMA sets out the criteria for the “chain ofintegrity” from the mine, through refining, delivery and vault storage. As long as the bullionis held this way, it is instantly liquid without the need for re-assaying. The allocated storageagreement needs to be carefully reviewed to ensure that the custodian cannot deal with yourbullion in any way. It is just as important to determine whether you have an actual custodial agreement, or if you are simply renting storage space in a secure facility. The obligations of a custodian are entirely different to those of a rental facility simply providing storage space. A custodian has much higher levels of obligations, and a written Custodial Agreement sets out what the custodian can and cannot do without the owner’s permission, and details the insurance coverage. Securing allocated storage also involves assessing the audited financial statements of thestorage facility to determine if the facility is owned outright, or if it has any third-party liabilities. 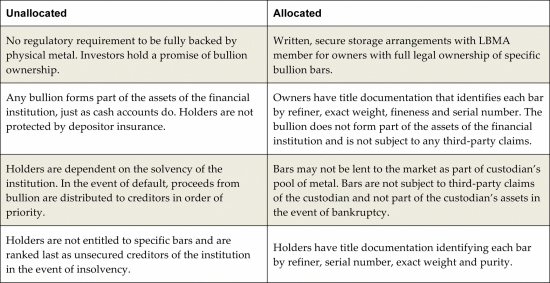 Depending on the jurisdiction involved, third-party landlords or lenders may have a priority claim on your bullion if the storage facility defaults on its obligations to them. Since starting the BMG BullionBars program, we have attended the vaults frequently to confirm the detailed reports from the custodian. Together with our auditors, BMG’s management has matched names and serial numbers to those of our clients who own thebullion. We can facilitate multimillion-dollar transactions within a day, and we have never experienced any delay when a client wishes to take delivery or sell his or her bullion bars. Today, there is a lot of Internet chatter that says taking physical possession of your bullion is the only secure alternative. While this may be practical for small holdings, it is simply not wise for large amounts of bullion. Unless you plan to swear your entire family to a vow of silence and secure your home as a fortress, it is not prudent to risk a home invasion in order to save onstorage fees. Private insurance on bullion stored at home, if you can even get it, will be far more expensive than allocated insured storage fees. I am unaware of any home insurance policy that covers gold bullion ownership. Selling your bullion, once it has been removed from the LBMA chain of integrity will require the added expense and delays of having thebullion re-assayed. The two-step process of buying uncompromised bullion with clear title and then storing it inallocated storage was covered in my articles Can a Cyprus Style “Bail-in” Occur with Gold and Unallocated Gold Storage Or Accounts: Avoid This Risk When Buying Gold. It was also covered last year in Paul de Sousa’s articleReal Gold vs. A Promise of Gold. Rather than repeat the points made in those articles, we decided to create a checklist that anyone buying and storing precious metals bullion can use to verify that the bullion they are buying is authentic and uncompromised, and that the storage is truly allocated. 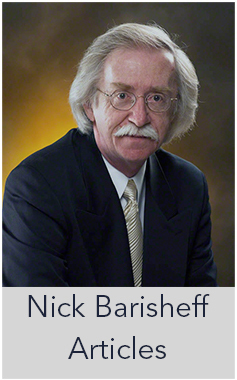 Unless these questions are answered in the affirmative, you may find yourself involved in a long legal battle, you may lose ownership of your bullion, or you may receive a cash settlement for a fraction of its value at the time of default. The following checklist should be used by all bullion investors. If your dealer, broker orstorage supplier cannot answer the questions on this list in the affirmative, then there is cause for concern. The printer-friendly version of this checklist is available on our website. Based on the above checklist, we believe that the BMG BullionBars program provides the most secure, cost-effective and transparent way to purchase and store investment-grade Good Delivery gold, silver and platinum bullion. Clients may take delivery at their discretion or request the BMG storage option. BMG’s custodial storage agreement with The Bank of Nova Scotia provides for bullion storage on an allocated and insured basis in Toronto, New York and Hong Kong. Gold is available in 400-ounce, 100-ounce and 1-kilogram bars. Silver is available in 1,000-ounce bars. Platinum is available in 50-ounce bars. Of course, this type of security comes at a price. The legal fees involved in setting up such a service, guaranteeing the clear title to each bar, triple checking the security of the vault and maintaining the proprietary software that allows us to provide monthly reporting while protecting our customers’ identities are significant. 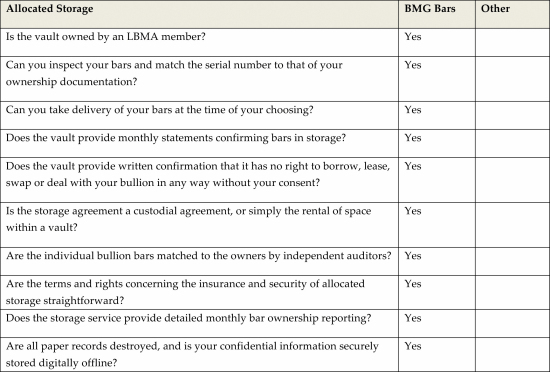 The cost of true allocated storage in an LBMA-member vault is also more expensive than storing one’s bullion at home or of renting space in a private storage unit. Yet what does that extra percentage point each year matter if it makes the difference of being able to take delivery of or sell one’s gold bar no matter what the state of market or the price of bullion? This is why we hold precious metals bullion in the first place—as insurance against financial calamity. It is at such times that we will need our gold most. 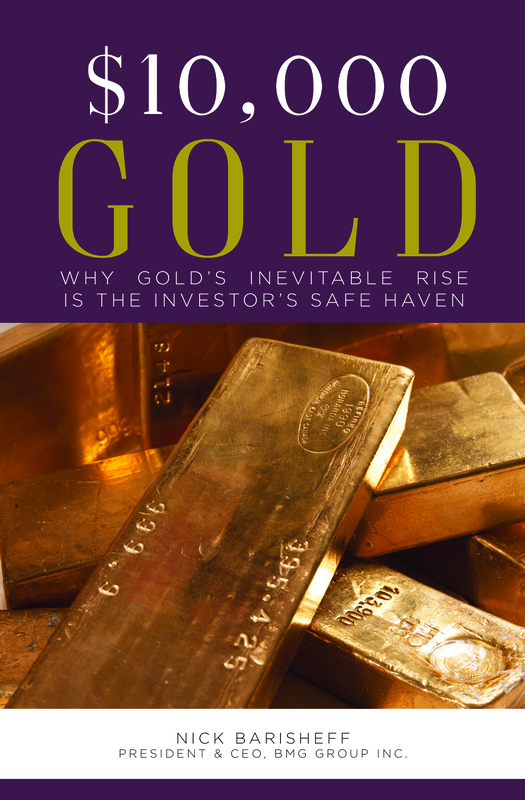 I hope my book,$10,000 Gold: Why Gold’s Inevitable Rise is the Investor’s Safe Haven, helps as many people as possible to grasp the issues surrounding gold, and to gain the confidence that can only come with knowledge. Through bullion ownership, I hope readers choose to become their own central bank so they may be each become a truly sovereign individual. The wealthy have used this strategy for centuries. They have also enjoyed the privilege of access to the underlying truth about money, which is now, thanks to the Internet and to open-minded publishers like John Wiley and Sons, available to most of the world’s population. Please study these issues carefully. Make the intellectual effort to distinguish facts from emotion. Your wealth, and the wealth of your children and grandchildren, depends on it.